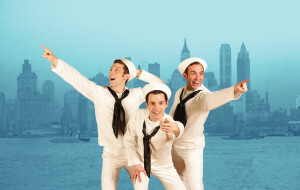 The classic early Bernstein-Robbins-Comden-Green World War II musical about three sailors on a 24 hour leave in New York City, done with energy and style. Three sailor friends are on a twenty-four leave in New York City. Immediately, Gabey falls in love with a picture of Ivy Smith, the month’s Miss Turnstiles, and his friends, Ozzie and Chip, resolve to help him locate her. In the process, they break off, and Ozzie encounters Claire, an anthropologist, at the Museum of Natural History. Chip takes a taxi ride with Hildy, a brassy cab driver. Together, they all continue the pursuit of Ivy. Miraculously, Gabey encounters Ivy, but there are misadventures, leading them to various nightclubs and eventually to Coney Island. Claire’s stuffy fiance, Judge Pitkin, and Hildy’s roommate, Lucy Schmeeler, add obliquely entertaining complications to the general silliness. 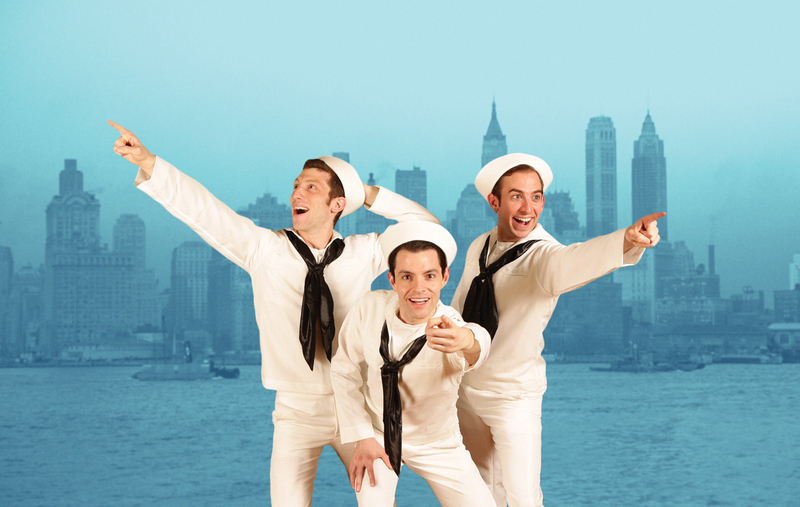 Composer Leonard Bernstein and choreographer Jerome Robbins had, shortly before coming up with On The Town, produced the ballet Fancy Free (1944), based essentially on the same idea of sailors on leave in New York. 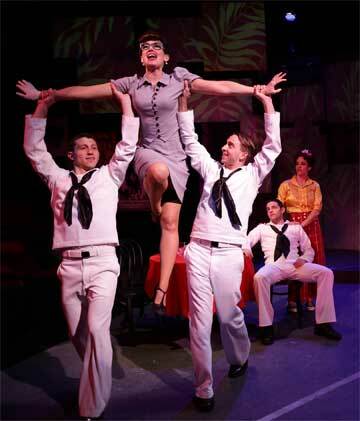 On The Town became the dramatized version of that ballet, made for the Broadway stage. Watching this compactly energetic production of the show, I realized how much of it actually retains ballet music and scenes which feature balletic dance. It makes sense, since the plot of the show is so intentionally light and inconsequential. But despite that lightness, the combined talents of Bernstein, Robbins, and lyricists Betty Comden and Adolph Green shine through. Bernstein was a mere twenty-six year old when he wrote this, but his genius is fully evident, demonstrating much of the briliantly lively, jazzy eclecticism that emerged in his later works. Even early on, Bernstein could write great, catchy tunes and surround them with fabulously sophisticated contextual composition that made for entertainment that was elevated high above the more simplistic and formulaic levels of musical theater. 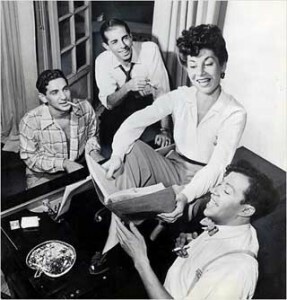 Nancy Walker, as Hildy Esterhazy, singing I Can Cook Too from the original Broadway cast recording of On The Town. The lyrics by Comden and Green, also twenty-somethings at the time, are delightful, and some memorable. This show contains a passel of classic songs: New York – New York, Come Up To My Place, Carried Away, I Can Cook Too, Lucky To Be Me among them. I grew up listening to the original cast recording in which Betty Comden played Claire, Adolph Green played Ozzie and Nancy Walker played Hildy. Those are pretty big shoes to fill, but the Lyric Stage performance rose to the occasion admirably well. The real standout in this show is Aimee Doherty, whose Claire has class and zip. She can really belt out a song and move with pizzazz. She is a great comic actress. Zachary Eisenstadt, as Ozzie, adds to the energy by doing flips and handsprings remarkably adeptly on the Lyric’s small stage. The production is lively and entertaining, and the dancing and singing are capable. The limited stage band, though competent, cannot match the exquisiteness of the orchestration that Bernstein’s score calls for. If you are drawn to the show, try to get a hold of one of the good recordings and listen to it; there really is great music in there. Leonard Bernstein, Jerome Robbins and Betty Comden were all in their twenties when On The Town opened on Broadway in December, 1944. Adolph Green had just turned thirty. Comden and Green starred as Claire and Ozzie in the production. A production with more stage room and resources might provide more balletic emphasis on the dance routines. They are capably done here, but it would be great to see what choreography and dance more specifically tuned to the original balletic take of the show might produce. Bernstein’s score integrates classically textured composition and jazz into musical theater, echoing Gershwin’s innovations with Porgy and Bess (1935) a decade earlier. Both bring the same interest in bringing new levels of musical sophistication to the popular stage. I saw the short-lived 1998 revival of On The Town on Broadway; I found this Lyric Stage production, though less grandiose and more intimate, considerably more energetic and appealing.